Good evening all from the Big Brother Shenandoah, where we have had an action packed and exciting day today, culminating in a gybe about an hour and a half ago. On the sailing front, apart from changes from night to day and vice versa, little has changed since we cleared the Canaries and got some wind. The swell is ever present and the only thing making an otherwise very comfortable sail a tad less pleasant. That was, until we gybed of course and now it’s all change. We were getting pushed further north by a NE breeze which veered more E every ten minutes, but we’re now on a course of 225 or so. Sail repair news is all good as we now have a mizzen sail, with the mammoth hand sewing repair job all done and dusted. 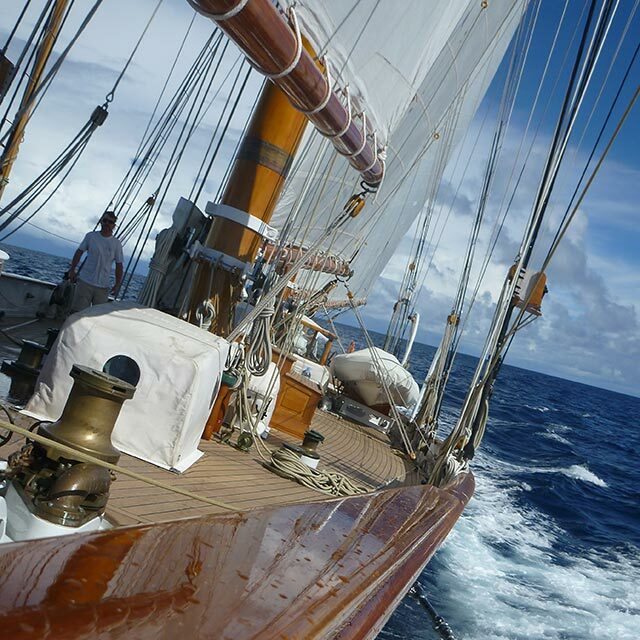 We have no way of reefing the mizzen however, so it’s all or nothing! The clew got lashed back on this afternoon and AL and Andy finished the foot rope finished so it’s all good to go. We currently still have the trisail set. A big afternoon in the harness for me as I spent an hour of the afternoon hanging over the sea at the aft end of the mizzen boom helping Bryan with the mizzen clew lashing. Apart from that life goes on. The tea is flowing, the yacht is carving her way inexorably towards the Caribbean, and it’s feeding time at the zoo, and my window is coming up, so I’m going to sign off. Well, what 24 hours is has been on the big blue bus! It’s all happening on here, as you’d expect by now. It all started with another big night of sailing and us making good headway with the three lowers, two topsails and four headsails up, bearing away when the apparent wind got a bit hot, and getting back on our SW heading when we could. We had some pretty impressive torrential squalls at times and gusty wind with them. It all started to happen at around 5.30 am when Tim, heading to make his pre-watch heart starter coffee, noticed the main topsail sheet had blown. It hadn’t made a sound out of the ordinary either when blowing or while flogging in the wind. So, we had that down. I headed below and stood by as it was touch and go as to whether we could hold the jib top. The fore topmast was having a bit of a hard time of it with the sea state and sail so it was decided to drop. Out into the net for me and Bryan and Jesse at daybreak and we got it down. Back below and looking forward to going to bed, I’d just got mine and Gemma’s wet weather gear hung up to dry when we got another call to arms! We had to drop the foresail, which had a tear top and bottom of a panel six feet up from the foot. Not 24 hours after finishing the mizzen repair, they were involved again. Denis and Kate were stood on the trunking when I came up on deck, going for glory with needle and thread. Gemma and Alan took up the baton for the last mile and the foresail was stitched and ready to go by late afternoon. 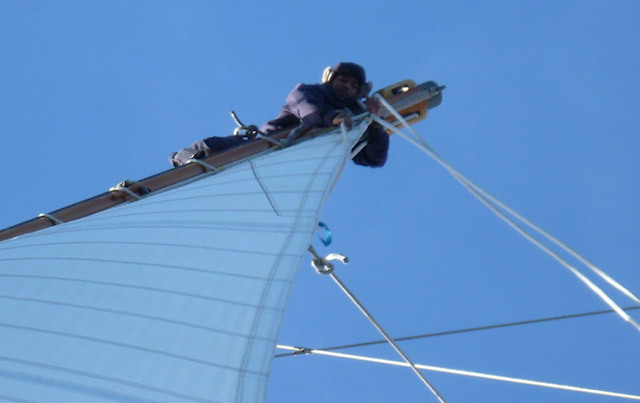 We dropped the main topsail and hoisted the foresail, finishing my watch off with a bit of overtime when we dropped the outer jib in pretty big swell which made for an exciting ride out on the bowsprit.